WASHINGTON — SpaceX has withdrawn its protest of a launch contract NASA awarded to United Launch Alliance earlier this year for a planetary science mission. SpaceX did not disclose the reason it withdrew the protest, and a company spokesperson declined to comment when contacted by SpaceNews about the withdrawal. According to GAO’s website, SpaceX filed a separate protest over the same contract March 25, which was also withdrawn April 4. The company also declined to comment on the difference between the two protests. When it filed the protest in February, SpaceX argued it could perform the same mission for a “dramatically lower” price than the $148.3 million value of the ULA contract. “We believe the decision to pay vastly more to Boeing and Lockheed for the same mission was therefore not in the best interest of the agency or the American taxpayers,” a company spokesperson said then. ULA is a joint venture of Boeing and Lockheed Martin. ULA said that it was selected in part because it offered schedule assurance for the mission. Lucy must launch during a 20-day window in October 2021 in order to carry out its complex trajectory of flybys of six Trojan asteroids and one in the main asteroid belt. Should the launch miss that window, the mission cannot be flown as currently planned. “This mission has a once-in-a-lifetime planetary launch window, and Atlas 5’s world-leading schedule certainty, coupled with our reliability and performance provided the optimal vehicle for this mission,” Tory Bruno, president and chief executive of ULA, said in the January statement announcing the launch contract. SpaceX’s decision to withdraw the protest comes to a relief to many familiar with development of Lucy. They were concerned about potential additional costs to the mission and threats to its schedule if GAO upheld the protest and forced NASA to recompete the contract for the launch. That additional work, such as planning to be compatible with two different launch vehicles while the contract was recompeted, threatened to negate any launch vehicle savings. SpaceX, meanwhile, is moving ahead with preparations for its next launch, of the Arabsat-6A satellite on the second flight of the Falcon Heavy. 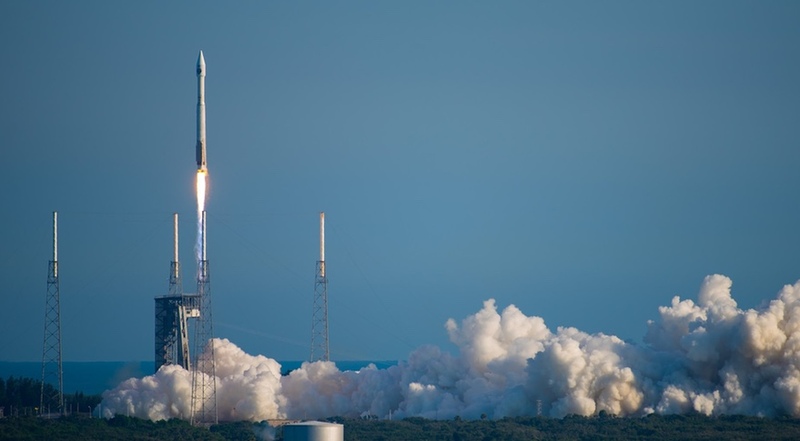 The company said the launch was now scheduled for April 9 from Kennedy Space Center’s Launch Complex 39A after the rocket’s three booster cores performed a static-fire test on the pad April 5. “This is first launch of Falcon Heavy Block 5, so we’re being extra cautious. Launch date might move,” SpaceX Chief Executive Elon Musk tweeted after the static-fire test.